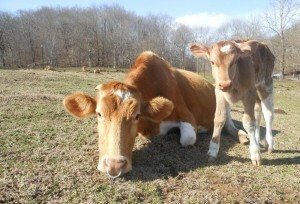 We’ve been anxiously awaiting the birth of a dairy calf here on our farm. 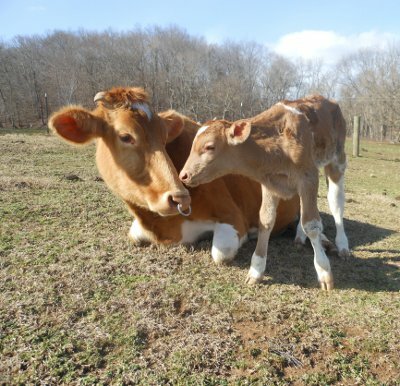 After weeks of checking and rechecking and nightly treks out to the cow pasture….One of our milk cows, Dixie, finally gave birth to a large, healthy bull calf Sunday afternoon! 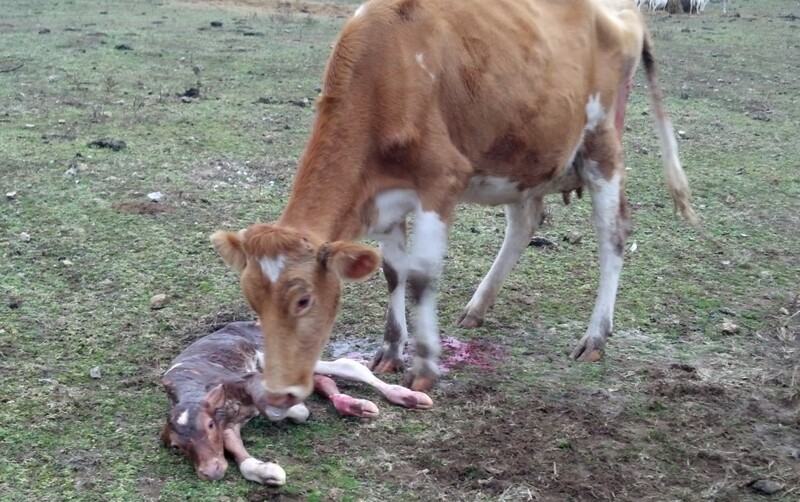 If you haven’t read my post about Waiting On A Dairy Calf, you should check out that blog post first. We had been looking up cow birthing information this week to refresh our memory. I found a great article entitled: 5 Signs You’re About to Miss Supper and read a few other articles about impending cow labor signs. We calculated she was at 275 days on Sunday. Perfect. Giving Dixie a little help. 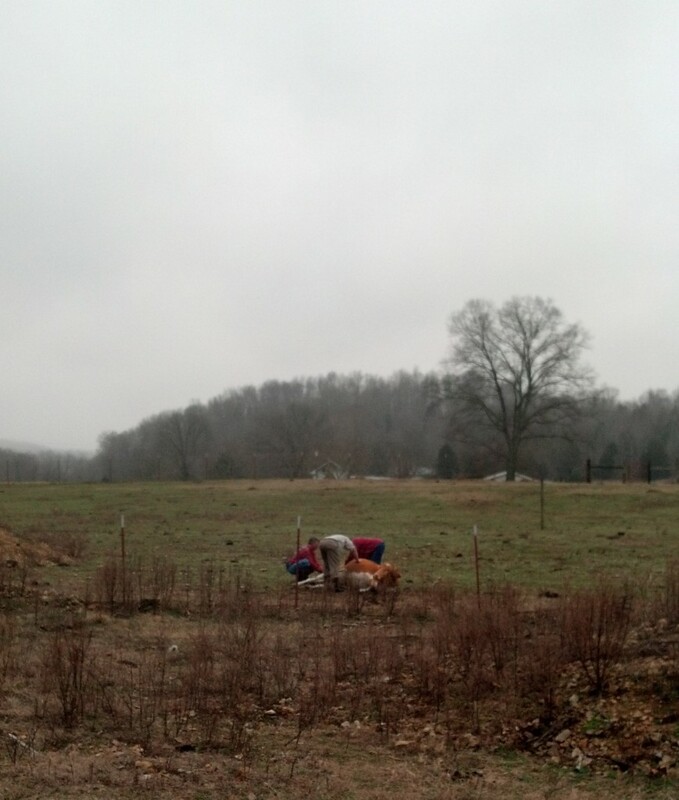 Our neighbor and Paul pulling the calf with her contractions. Last week, Dixie really started having some impending labor signs. Her back-end dramatically changed. Her udder was really filling out and she was lying down a lot, having a hard time walking etc. etc.. I was shutting down the children’s supper time conversations left and right as they centered around cow secretions and cow body parts as it related to the impending birth. Sometimes you can just get way to much information from a 9 year old farm boy! On Sunday, we went to church and as we arrived home that afternoon, we drove in the driveway to see our cow lying in the field and without a doubt — definitely in labor. Our neighbor pulled in our driveway right behind us. He told us that someone stopped by his house and told him that our cow was in labor and it looked like it was not coming out the right way. We quickly made it to the field and when we approached Dixie, the calf’s feet and nose were out (good, so far) but it was obvious that Dixie was having a hard time. The neighbor, being way more experienced than we, dove right in and started to pull the calf’s legs while Paul worked on getting the shoulders and then hips out with the contractions. 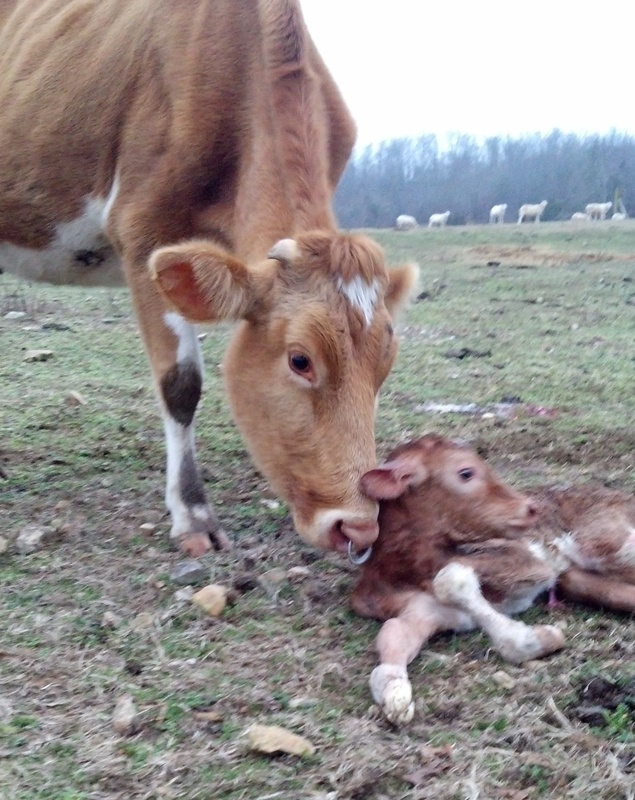 Within a few moments, the calf was born. Dixie was exhausted. Our kids were looking on in amazement and wonder and with much excitement! I’m sure every family friendly farm milk cow wants lots of noise and onlookers when she is trying to deliver a calf. Dixie is a good family cow and didn’t seem to mind all our commotion. I kept telling the kids to be quiet and respect the momma cow who just had that ginormous elephant size calf come out of it’s back-end. I’m sure I was the only one having sympathy birthing pains for her. Dixie got up with our encouragement and quickly found the calf and started licking him and making momma moo grunts to him. She licked and licked him. She then found his umblical cord and snipped it off just at the right length. Gross… but very cool that she knew exactly what to do. We stood and watched in awe and amazement at the miracle of birth and new life. It took a long time for the little guy to get up on those long stilts of his that are suppose to be his legs, but when we left the barn to come in for supper, he was up and nursing. After all the kids and cows were safely settled, a powerful storm blew in and dazzled us all night long. We awoke to happy cows and happy sheep in the pasture. We greeted the morning with much gratitude to God for His watchful care over us and the blessing of new life on the farm. Now for us……. We will start back milking here very shortly. And that country Vet…well, he was right on! So happy for you guys! I’ve been missing your posts. Kevan and I are waiting for Spring to buy our animals (chickens, goats and a pig) and it is nice to hear it is going well for someone else. We are still a bit scared that we might not be able to do it, but your posts help by giving us some hope. The best part of farmin’!! Birth always amazes me! We’ve seen it many times, but it is so amazing every time!